Garden Pest Patrol is a new series that we are doing this month! Stay tuned each week for a new post on how to deal with garden pests. Subscribe to our newsletter to make sure you read each post! Out of all the garden pests I've ever encountered, slugs are by far the grossest. I think many of you would agree with me there! And whether they're feasting on your just ripened melons or chewing (do they have teeth?) on your plants foliage, they are a huge nuisance. If you're lucky enough to live in a wet area like us, you're bound to have to deal with slugs at some point or another. Besides the fact that they are quite disgusting and very slimy, they are actually quite interesting creatures. Slugs are hermaphrodites, and can lay up to 400 eggs per year (hopefully not in your garden). The eggs take a few weeks to hatch, but the eggs can also remain dormant in the soil for a few years. Slugs can actually live for over two years! They love to munch on quite a few different types of plants: flowers, greens, vegetable seedlings, and fruit such as strawberries. They can consume twice their weight in food in just a single evening. They require moist conditions for survival, because they have trouble maintaining the proper moisture level in their bodies. They can absorb water right through their skin! So how can you prevent slugs in the first place? Slugs love to spend time in moist dark places, so hiding under boards or other debris is one of their favorite spots. Keep your garden area free from these slug hideouts to encourage them to live somewhere else. One of my favorite suggestions on preventing slugs stems from permaculture. Add a small pond area near your garden! Natural predators to slugs include toads, snakes, turtles, and salamanders. All of which love living near a water source. Additionally, if you already keep chickens or ducks, they're already helping you keep down the slug population. Ducks especially find slugs to be very tasty! But what to do to stop the slugs that are currently feasting on your garden? 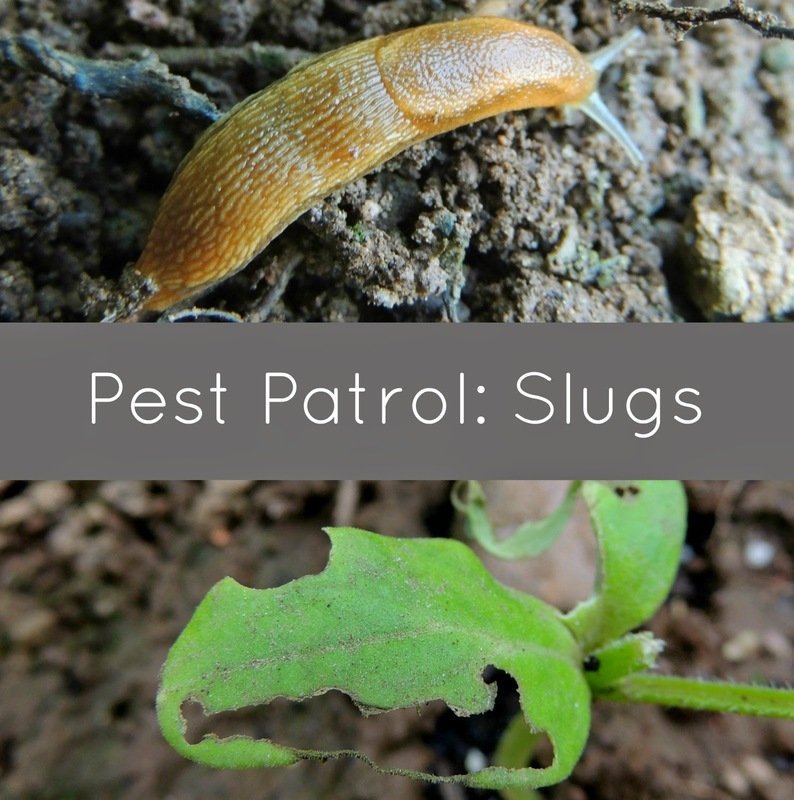 There are a few popular ways to deal with slugs and we will outline each of them here: handpicking, beer traps, crushed eggshells, coffee, diatomaceous earth, and a copper barrier. So clearly, there are a lot of options to deal with slugs! If you read the first post in the series, you already know that handpicking pests is my absolutely favorite way to deal with them. And I personally find this to be by far the most effective method for eliminating slugs. You may want to wear gloves because slugs are incredibly slimy! There are two approaches I use for handpicking slugs. One includes simply tossing them into a bucket with some soapy water in it. The other method is using a pair of garden scissors, slice them in half as you go. The best time of the day for slug hunting is early morning and in the evening. Just a few days of handpicking can drastically reduce the number of slugs in your garden! You can even lure the slugs to certain areas for easier handpicking by placing boards flat on the ground. The slugs will congregate on the underside of the board and you can simply remove them! Just remember to remove the boards afterwards, since you don't want to encourage more slugs to move in later. These traps are an incredibly popular method for getting rid of slugs! They are also very easy to construct. Slugs have a surprisingly good sense of smell and are attracted to the beer. Take a plastic cup or container and bury it in the soil so the top of the cup is level with the soil. Fill the cup to about an inch below the top. The slugs will head on down to get at the beer and become trapped! The beer must be dumped out and changed every few days or after a rain. This is an excellent way to protect sweet smelling fruits as they ripen. Slugs love the melons we grow and this is a way to lure them into feasting on something else and leaving the melons for us! The only downsides to this trap is how often it must be changed and that it only attracts slugs in the few feet surrounding the trap. So be sure to place a few around the target areas of your garden! Applying crushed eggshells around the base of a plant, especially young seedlings that are more vulnerable, are said to cut into slugs as they try to move across them. These cuts can either kill the slug or deter it from crossing the crushed eggshell barrier. If you already keep chickens or ducks, you have a steady supply of eggshells at your disposal. If not, save eggshells prior to starting your garden for the season and after planting your seedlings, sprinkle a barrier in the soil surrounding the base of the plant. Caffeine is said to do two things to slugs. In a high enough concentration (1-2%) it will kill a slug, in lower doses it will make them lose their appetite. There are mixed opinions how exactly how much caffeine a slug must be doused with to be effective. Generally a 1-2% caffeine solution is the accepted level. Another option is scattering coffee grounds, in moderation, around the plants being eaten. Personally, I think other methods are more effective than using caffeine. DE powder is made up of the sharp remains of microscopic little creatures. Although it appears smooth and powdery to us, to small soft bodied bugs, it can slice right through them. This is very effective on slugs when scattered on the ground around the plants. You must make sure to use DE that is food grade and use care to not get it in your eyes or breathe in the dust. Wearing a mask is best. Although DE works very well against slugs, it also harms the many beneficial organisms that are in your soil. So keep that in mind when considering it's use in the garden. DE is no longer effective after it gets wet, so it must be reapplied after rainfall. Thin strips of copper can be placed along the soil at the edges of your garden beds. Copper strips 2-3 inches in size are best. These strips can be laid down flat, or stood up vertically to create a fence that the slug must climb over. The copper gives the slugs a shock, and makes them leave the area. This is one of the more costly solutions to slug issues and there are many copper barriers on the market designed specifically for deterring slugs. Click on each photo for more information.